In the last post, we discussed some of the major benefits of investing in custom t-shirts and other apparel for your business. However, there are several more advantages that need to be addressed in order to give your business a full understanding of the ways apparel can help with overall brand promotion and marketing. Here's part two of our guide that will explain some more major benefits of investing in custom t-shirts for your business. Even when separated from the purpose of business promotion, the overall apparel industry is a booming one. 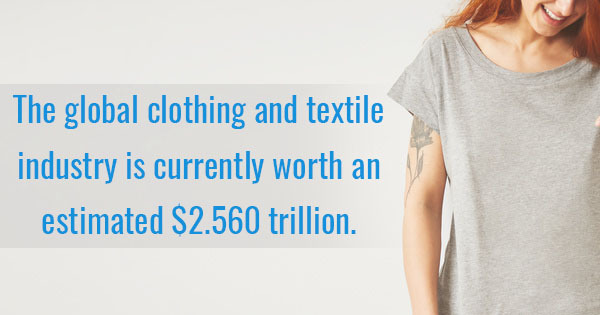 The global clothing and textile industry is currently worth an estimated $2.560 trillion. Not only that, but with the increasing interest for sustainable and eco-friendly materials, annual revenue for organic cotton-made textiles has grown to roughly $5 billion in recent years. This means that while any type of business apparel is sure to be effective when designed and created with high-quality materials and manual heat presses, those made with organics can give your business another major leg up above the competition. With all of these ways to expand consumer interest and broaden your company's overall audience, you have unlimited freedom to design and market your brand's apparel however you choose. Finally, investing in custom t-shirts and other apparel for your business is particularly ideal for local patrons in the community. Those who see others wearing business t-shirts can instantly notice the increased reputation your business must have. Think about it -- there are millions of t-shirts and apparel designs available for consumers to choose from, so there must be a good reason they're wearing a t-shirt that proudly represents a local business. It's because that business deserves representation and support because it's a high-quality business. Encourage that opening of dialogue by making your t-shirts and other custom business apparel as readily available as possible. Ultimately, understanding these benefits is the key to making the most of your business's opportunities to invest in custom apparel. For more information about manual heat presses or the various types of heat press replacement parts, contact Instagraph.